Harold Abrahams: I’m forever in pursuit and I don’t even know what I’m chasing. The moment you see the cluster of bare feet splashing in the water as they run along the shore of the beach, with the classic Vangelis score almost cheering them along, you know that you are about to watch one of the finest films ever made. 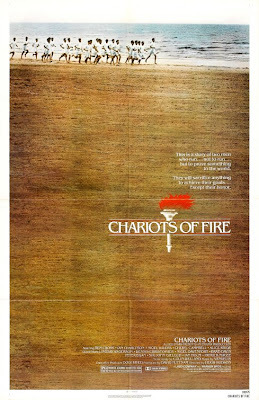 It is the unmistakable introduction to the Oscar winning masterpiece, CHARIOTS OF FIRE. A period piece in nature, it is propelled forward by the youthful exuberance that stems from each of its idealistic young male leads. And while director, Hugh Hudson allows just the right amount of time and pace to respect the genre, it is still an incredibly tense race to get to what promises to be an electrifying finish. In 1919, a young man by the name of Harold Abrahams (Ben Cross) took up attendance at the University of Cambridge. Abrahams is a gifted man. He can run faster than any Cambridge man who has ever come before him, proving this to his colleagues and professors by taking on a running challenge that has never been beaten before and beating it on the first day of school. His unflinching confidence allows him to pursue his every whim and desire, no matter whether that be the love interest of one of his best friends or the coach of a rival runner. And even though he stands at the top of his game, he still feels as though he has something to prove because he is Jewish. Harold even sees his time at Cambridge to be suspect, suggesting that they have led him to the water but they would never let him drink. So, Harold runs. He wants to win in the name of his country and his university but what propels his feet is his deeper need to throw his win in their faces. Harold has a nemesis. Hailing from Scotland, Eric Liddell (Ian Charleson), runs for a very different reason than Harold. Eric runs because he believes that the very grace of his Christian God guides his feet to glory. “If you commit yourself to the love of Christ, then that is how you own a straight race,” Eric says to a gathering of other believers. Though he believes at first that his racing journey will lead him closer to God by allowing him to honour the gifts he has been bestowed, it appears to take him further away instead. He must postpone his missionary work duties in order to pursue the dream of Olympic gold and as he strays further away from helping others, he begins to question whether he truly is just helping himself. The fact that Eric is devoutly Christian deepens his rivalry with Harold, although not directly by either party. Colin Welland’s beautifully subtle script demonstrates an awareness of the characters’ symbolic elements but also ensures that they each have individual growth to inform their true character. As the entire narrative CHARIOTS OF FIRE builds towards the 1924 Olympics in Paris, France, just as it did in the real lives this film was based upon, the focus on the racing itself distracts these young men from some of the more pressing issues of the day. While they enjoy their privileged pursuit of higher education and world renowned athletic acknowledgement, the generation that came before them was devastated in the first World War. Bigotry and prejudice brew in hushed conversations that are mounting in volume. And even though all these young men come from their own potentially tarnished backgrounds, every single one of them comes from privilege. No matter how fast they can run, they will never outrun the growing unrest coming up behind them. These young men run on a track all their own though and they still leave enough dust in their tracks to keep blindly running forward in pursuit of gold.